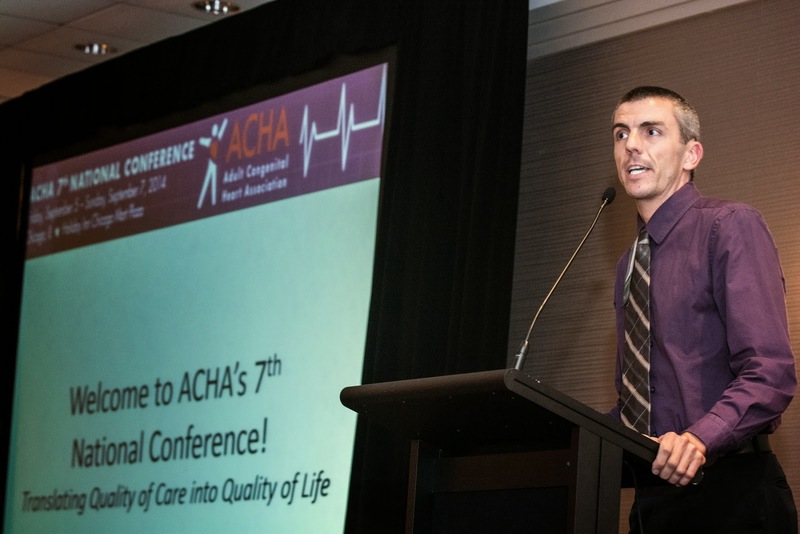 Earlier this month, I attended ACHA's 7th national conference (my first!) in my hometown of Chicago. The conference brought together over 500 CHD patients, family members, and medical professionals for a weekend of learning, sharing, and collaboration. What an amazing group of people to be among! For many of us patients, who can often feel isolated and alone with our CHDs, this was a wonderful opportunity to connect with one another, learn together, and share our stories and journeys with others who truly understand and can relate to our unique situations. The conference theme—Translating Quality of Care into Quality of Life—resonated throughout the weekend at joint sessions, small breakout presentations, and topic-specific clubhouse groups. I had the honor of serving on the conference faculty and speaking at a joint session about my own journey of falling (quite literally!) back into care after a 10+ year hiatus. And I had the privilege of connecting with friends from around the country and making some new ones. I, like many of the conference attendees, will have stories and memories about that weekend for years to come. But one thing in particular that will stick with me (not only from the conference itself, but also from my volunteer work with ACHA) is the genuine passion and unwavering dedication of so many people within the CHD community. It is truly inspiring to see the determination of so many medical professionals, patients, and family members working together to fulfill ACHA's core mission: to improve and extend the lives of the millions born with heart defects. On one hand, I am a bit surprised that today—in 2014 and with all of the advances made in medicine—so many of the efforts within the adult congenital heart disease community still feel somewhat grassroots. A while back, when I first learned that no board certification exists for ACHD cardiologists, I was surprised to say the least. But when I saw the closing keynote address at the conference—"Sustainable High-Quality ACHD Care in the United States"—I got a better understanding of where we are currently in the context of CHD care and treatment historically. I not only felt inspired and motivated. But I also felt like we are actually a part of history in the making. As a CHD community, we have come so far already. And yet we still have so far to go. I wholeheartedly (no pun intended) applaud the efforts of ACHA’s Medical Advisory Board for its leadership and ability to make important advances on behalf of all CHD patients. Not only is board certification for ACHD cardiologists soon becoming a reality, but we will also soon have standards established for the accreditation of ACHD centers throughout the country. As we celebrate the fact that more and more people with CHD are living to adulthood, we recognize that this also presents new challenges for us; and I believe we have the responsibility to continue working together—as patients, doctors, and advocacy organizations—to continue translating quality of care into quality of life far beyond a weekend conference.